A new year, and a new look for the ARES E-Letter! We hope you will find value added in this new html edition, with photos, graphics and tables. For readers who prefer the text-only version, each message contains both a plain-text version and an HTML version. Your e-mail program can select the one to display. Astute readers will also observe that there are ads. The revenue generated by these advertisements offsets the expense of producing this newsletter and more: It goes to supporting the significant ARRL initiatives in the Amateur Radio emcomm arena, including the ARES program, publications and planning, and a dedicated support staff in Newington. In other words, ad revenue goes to a good cause. And, of course, the ads may be of special interest to emcomm operators. It has been a quiet holiday season for Flagler ARES, but our meeting was held this past Tuesday night at the Flagler firehouse (too late for a report in this issue) to kick off 2009, with only five months before hurricane season. Letters: The Importance of "Sig-Files"
Massachusetts and New Hampshire, December 11 -- The major ice storm that hit New England resulted in Amateur Radio operators responding to calls for assistance from various served agencies. Eastern Massachusetts SEC Rob Macedo, KD1CY, reported almost 400,000 customers in Massachusetts lost power. Western Massachusetts SEC John Ruggerio, N2YHK, said his ARES units responded to local EOCs. A team in Gardner provided communications for the local hospital and EOC, with message traffic on prescription fills and other priority, but non-emergency traffic, being fulfilled. Eastern Massachusetts ARESMAT supported the operation. Massachusetts State RACES Radio Officer Tom Kinahan, N1CPE, and his team supported the State EOC. New Hampshire ASEC David Colter, WA1ZCN, said his people supported two shelters and EOCs. The Milford animal shelter was also supported for rescue efforts. Hams Are The Eyes Of NOAA Near Reno, Nevada -- On Friday, December 19, a major winter storm hit the area bringing with it hurricane force winds to high elevations, such as Virginia Peak, located northeast of Reno near Pyramid Lake. Gusts of over 140 miles per hour battered the mountain, damaging sensitive electronic weather gear, including the NEXRAD radar system used by the National Weather Service office located in Reno. A link is available for viewing the damage. According to a press release, last month the U.S. Department of Homeland Security's (DHS) FEMA released a revised National Incident Management System (NIMS)--the national standard for incident management. NIMS establishes standardized incident management processes, protocols, and procedures that all federal, state, tribal and local responders will use to coordinate and conduct response actions. See the FEMA Fact Sheet, What's New, and FAQs. The Southeastern D-STAR Weather Net was created using the D-STAR digital voice and data technology to allow amateurs to link systems and communicate across the southeastern US, an area prone to severe weather conditions. With the rapidly growing number of D-STAR users and repeaters across the Southeast, the ability to use these systems to communicate across the wide area and support emergency communications has been created. Alabama was an early leader with a statewide deployment of D-STAR repeaters. Georgia is creating a statewide network of D-STAR repeaters using the television towers of Georgia Public Broadcasting. South Carolina plans to overlay their existing statewide network of analog repeaters with D-STAR repeaters. Many areas of Florida are already covered with D-STAR systems. 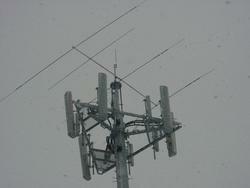 The weekly net allows training in net communications over a wide area digital network of linked repeaters. Check-ins are facilitated using the "quick key" format. Since call signs are automatically included with each D-STAR transmission, users simply key for one second to send their call. Net Control sees all call signs and recognizes each station. The net was used during last summer's hurricane season linking several EOCs across the southeast. During the winter "off season" for severe weather, a short program is being presented every other week during the net on topics such as repeater linking and the D-RATS data software. Each week, 35 to 40 stations on 17 to 25 repeaters across the southeast check into the weekly net. [Last month's item had a busted link on the New Madrid Fault report. Here is the item and a better link - ed.] The U.S. DHS/FEMA has just released a comprehensive new report on the threat and it contains a wealth of information for those who may be planning exercises. The complete report is a large PDF file, but well worth the download time. I just read the latest ARES E-Letter and saw the short piece by my friend and fellow EC, Mark Perrin, N7MQ in Lane County, Oregon in which he gives a reference to the Lane County ARES frequency plan. I work closely with Mark because I'm the EC in coastal West Lane County, which is separated from Lane County itself by the Oregon coast range (and a tunnel). Although Mark and I are in the same county, the Florence area has a separate ARES/RACES group because of our potential isolation. On the subject of repeater frequency availability discussed in the last issue, Robert King, W5LVB, had a good idea in having the state and/or local EMA's get repeater info from the ARES/RACES coordinators and then posting it on the EMA's Web site. There is currently a federal grant-funded project known as CASM (Communications Asset Survey and Mapping) that catalogs all public safety frequencies, tower and repeater locations, base stations, number of mobile and portable radios in each agency, and what frequencies are programmed in them. All of this information is being entered into an Internet-accessible database maintained by DOD. 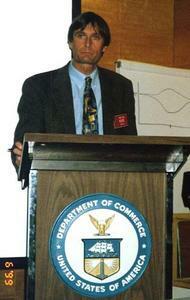 The focus of this project is for each state to develop a Tactical Interoperability Communications Plan, so that if agencies have to leave the "comfort zone" of their own communications systems to provide mutual aid elsewhere, they know before they go what frequencies (if any) they have in common with the jurisdiction they are going to help. In today's world of software-driven radios, it is easier than ever for an agency to program their radios to include frequencies for adjacent counties, state-wide mutual aid, etc, sometimes even "on-the-fly." The site's mapping function displays repeaters, towers, and types of communications systems as icons on a map of the state, and includes basic data on the system such as: repeater or simplex, tower site lat/long, frequency band (VHF/UHF/800), analog or digital, conventional or trunked, wideband or P25. As this project expands, the plan is to include data on communications systems used by mass transit, public schools, public works, highway maintenance, and ARES/RACES. The recent ARRL Earthquake Drill of December 18, 2008 identified a number of problems with our outdated, manual "phone tree" notification system here in Alabama. Not only had we been remiss at not moving to an automated, rapid notification system years ago, but a great deal of our contact information for District Emergency Coordinators and Emergency Coordinators was out of date. In desperation, I began searching through literally hundreds of e-mails that I have organized into folders on my computer, sorted by District and then county. This helped some, but in many cases, I would have dozens of past communications from an ARES leader, signed with only a first name and call sign. Not much help there. If you're involved in ARES, it's vital that we take a cue from emergency management professionals and automatically include a "signature file" with each message we send. This way, in an emergency, all that is needed is to find one your past e-mails and retrieve the information from there. Most e-mail software such as Outlook, Outlook Express, Mac Mail, Eudora, G-Mail, Hotmail, etc. all allow for this in the "settings" section. 1. He avoids turning it into a "brag file." We don't need to know all your titles, or how many FEMA courses you've completed. Save that for when your brother-in-law visits. 2. He includes a mailing address, and all telephone numbers where he can be reached. If you have a FAX machine, be sure to include that here. FAX is often a great way to get through. 3. Most cell phones can receive short SMS Text Messages sent from other phones, or in the form of an e-mail message. If you're not sure what that is, consult your carrier for assistance. SMS text is a great way to notify all your volunteers at one time, just by sending a single e-mail. The National Hurricane Conference is scheduled for the week of April 6, 2009, in Austin, Texas. The primary goal of the National Hurricane Conference is to improve hurricane preparedness, response, recovery and mitigation in order to save lives and property in the United States and the tropical islands of the Caribbean and Pacific. In addition, the conference serves as a national forum for federal, state and local officials to exchange ideas and recommend new policies to improve Emergency Management. Dennis Dura, K2DCD, ARRL Emergency Preparedness and Response Manager, was successful in getting Amateur Radio on the conference docket at three times. This is a first for Amateur Radio's involvement with the NHC. On Tuesday, April 7, from 1330-1700, the topic is "Amateur Radio Training," that will address events of 2008 and improvements for 2009. Multiple presentations are expected to include WX4NHC-The National Hurricane Center, Hurricane Watch Net, VoIPWX Net and IRESC, among others. On Wednesday, April 8, at 0930-1030, is "Situational Awareness and Disaster Intelligence, Non-Traditional Roles for Amateur Radio Resources for Emergency Management." Following is a 1030-1200 "Amateur Radio Rap Session," an open forum, and continuation of the previous two days' topics and anything conference attendees want to bring up. Both of these sessions are geared to the emergency management community so they can learn about the mission capabilities amateur radio has to offer. The Tuesday session is free to all radio amateurs-no registration is required. The Wednesday sessions and the rest of the conference are included in the conference fee and there are no discounts. All amateurs are invited to attend EMCOMM U, a one-day emergency communications workshop sponsored by San Joaquin County (CA) ARES. It will be held on Saturday, March 14 in Stockton, at a new county-owned meeting facility. The three-track program features sessions on emerging technology for emergency communication, how to organize and manage volunteer groups, and improving emergency response and operations. There will be sessions on emergency uses of D-STAR and packet, as well as discussion of real world traffic handling, how to develop better exercises, how to operate more effectively during emergencies and other topics. The Emcomm Show-and-Tell invites amateurs to bring emergency vehicles, response kits, and other items to show and demonstrate for attendees. Registration is limited to 100 people. The $25 workshop fee includes lunch and a $5 donation to the San Joaquin County Chapter of the American Red Cross. For more information, or send e-mail to the organizer. 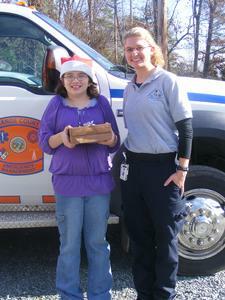 Michaela Woodward presents a Christmas Day gift of Moravian-style coffee cake to Orange County EMT Amy Turner. Hillsborough, SC--The Orange County Radio Amateurs (OCRA) recognized the workers of several Orange County agencies with a Christmas Day gift of freshly baked Moravian-style coffee cakes. Staff on duty at the Orange County Sheriff's Department, the Orange County EOC, and the Hillsborough Fire and Police Departments, were surprised late Christmas morning when OCRA President Raymond Woodward, K3VSA, and his family presented them with the cakes, which were baked by Dewey's Salem Bakery of Winston-Salem. Woodward said "we cannot do enough to thank these people who are working, protecting all of us on Christmas day when the rest of us are safe at home relaxing with our families." "We ham operators know what it's like to do emergency service, because we supply radio communications when the normal means of communication go down, so we just wanted them to know that their service to the community is appreciated." Alabama SM Jay Isbell, KA4KUN, in front of hospital van. K1CE at the podium, National Hurricane Center, Miami, Florida. I joined the Emergency-Management forum at Yahoo, which is moderated by a long-time contributor to this newsletter, Lloyd Colston, KC5FM, of Mayes County Emergency Management, Pryor, Oklahoma. It looks good so far, and I'll provide some feedback in the next issue. Nunzio Addabo, W4VYD, of Tucson, Arizona, sent me a signed copy of his book Ham Radio Heroes, published last year. It is a compendium of stories from throughout Amateur Radio's history, and I'm looking forward to reading it. There are more than one hundred episodes. Thanks, Nunz!